Ask somebody to name the most important inventions of the second half of the 20th century, and you may hear of the silicon chip, the contraceptive pill, or the hydrogen bomb. Few would answer the shipping container. “Yet those humble, standard-sized steel boxes, invented in 1956, have changed the world,” writes The Economist (Mar. 1, 2014). Some economists think the shipping container has done more for global trade than every trade agreement signed in the past 50 years. Even revolutionary products can be improved, though, particularly after half a century of service. One idea just proposed at the American Association for the Advancement of Science, is to make containers out of carbon-fiber composites. Such containers would be easier to use, because they would be lighter and might be folded flat when empty, saving space. A carbon-fiber container would need to travel only 120,000km (three times around the Earth) to prove cheaper than its steel equivalent. It would also be more secure, because it would be easier to scan without being opened. That is an important consideration. In 2006, Congress passed a law requiring all containers arriving from abroad into American ports to be scanned to make sure they do not contain drugs, illegal immigrants, or fissile material. Doing this has proved hard, though, and the deadline for compliance is constantly being pushed back. Scanning steel needs high-power X-rays, or even gamma rays. These are expensive and dangerous. Carbon-fiber could be scanned with “soft” X-rays, which are easier to generate and use. Another way to improve containers’ security is to track them properly. 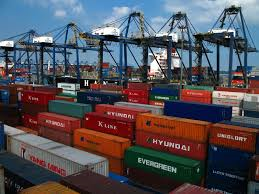 At the moment, authorities in a given port are usually told only about a container’s most recent movements. Better to give each container a comprehensive history, recording every port it has visited and every ship that has carried it. Such data could be crunched to detect suspicious patterns. Carbon-fiber containers, fitted with sensors, a travel history and the ability to talk to the authorities, may one day replace many customs officials.